The third generation Cadillac Eldorado was new for 1957. Back in these days, car manufacturers were making styling changes for every model year. It’s when Detroit was king and the money was a-flowin’. This car is a very special Cadillac – not only is it an Eldorado Biarritz, it is a GM factory prototype. 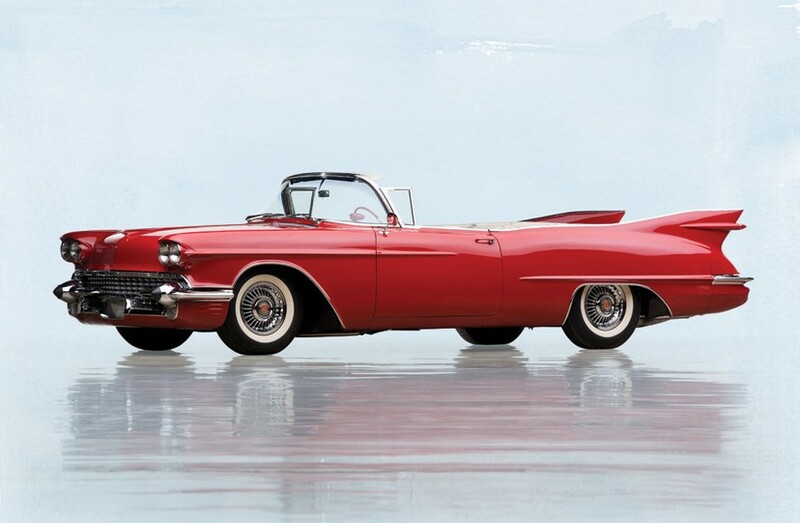 It started life as a 1958 Eldorado Biarritz, the top trim of Cadillac’s halo model. GM updated it with many upcoming 1959 features, including the over-the-top tail fins that made the ’59 Caddy so iconic. The interior is one-of-a-kind but the engine is a standard Series 62 335 horsepower 6.0-liter V-8. It’s a boat, for sure, but it has a very special feature, dubbed “Raindrop.” The system uses a humidity sensor that detects water in top-down driving. When a few drops trip the sensor, the top of the trunk separates and slides away, allowing the roof to fold up and close automatically. Even the windows roll themselves up. It’s a fascinating piece of engineering. This car was given to Harley Earl when he retired and he used the car around Florida in his later years. It was subsequently restored and is being offered with a pre-sale estimate of $600,000-$800,000. Click here for more info and here for the rest of this sale’s lineup. This entry was posted in Uncategorized and tagged 1958, auctions, biarritz, cadillac, cars, classic cars, convertible, eldorado, prototype, raindrop, rm sothebys by classiccarweekly. Bookmark the permalink.